"This is a treasure trove of principles for the complex task of understanding Scripture. A must-read for the serious student of the Word." ^^^^This handbook provides a one-stop-shopping guide to the New Testament exegetical method. Brief and approachable, it offers both a broad overview of the exegetical process and a step-by-step approach to studying the New Testament in depth, helping students and pastors understand the text and appropriate it responsibly. The book is chock-full of illustrations of New Testament texts where the method under discussion truly makes a difference. ^"Blomberg and Foutz Markley have written a wonderfully clear and accessible handbook for New Testament exegesis. The book covers the various steps of the exegetical process and gives sane and sage advice throughout. What makes the book especially illuminating and interesting are the many examples from the New Testament that illustrate the principles discussed. Professors and students will be grateful for a work that is exegetically rigorous, theologically informed, and practically useful." 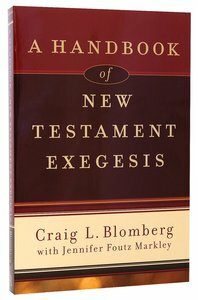 ^^"In this immensely practical guide to New Testament exegesis, seasoned New Testament scholar Craig Blomberg teams up with Jennifer Foutz Markley to produce another winner. The text walks the student through all key aspects of New Testament interpretation, striking just the right balance between scholarly acumen and simplicity of presentation." About "A Handbook of New Testament Exegesis"